Most of the 45-mile long Elwha River, which flows into the Strait of Juan de Fuca, is located in Washington’s Olympic National Park on the Olympic Peninsula. The river is home to all five species of Pacific salmon, including Chinook, Coho, Chum, Sockeye and Pink, and three species of trout. Before the dams were built, 400,000 salmon returned to the river to spawn each year, but now fewer than 3,000 return to the 5 miles of habitat that lie below the first dam—90% of their native habitat is unreachable. 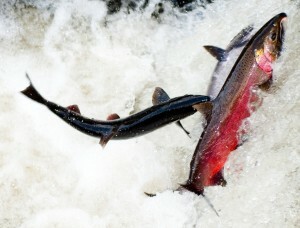 Even if expensive fish passages had been added to the dams to help salmon migrate upstream, the dams’ other environmental effects would still have prevented the salmon species from recovering. The indigenous Lower Elwha Klallam tribe, whose creation site was flooded when the dams were built and who once depended on the salmon for survival, opposed the dams from the beginning. The 108-foot high Elwha Dam, completed in 1913, was constructed to supply power to the city of Port Angeles and a lumber mill. 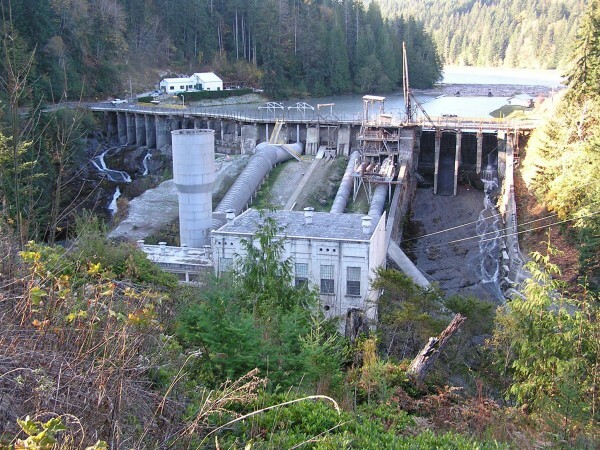 Power generated by the 210-foot high Glines Canyon Dam, built further upstream in 1927, supported additional economic growth on the Olympic Peninsula. But today, the two dams provide less than half the power needed by a local paper mill. 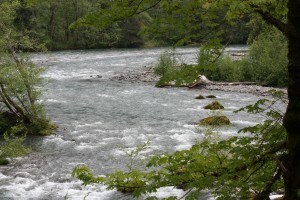 In 1992, the Elwha River Ecosystem and Fisheries Restoration Act provided for the restoration of the Elwha through the removal of its two dams. The project’s $325 million price tag includes the acquisition of the two dams and hydroelectric plants from their former owner, and construction of two water treatment plants, flood protection facilities, a fish hatchery and a greenhouse to grow native plants for revegetation. Different techniques will be used to remove the two dams. At the Elwha Dam, which is broad and relatively short, the reservoir water level will first be lowered through existing spillways. Cofferdams, temporary enclosures, will be built to divert water into interim channels so that the river’s original channel can be excavated. After the powerhouse and other structures are removed, the diversion channel will be filled in and the river will be returned to its natural path. The dismantling of the taller Glines Canyon Dam will involve the construction of temporary spillways on either side of the dam to drain the reservoir, then layers of the dam will be removed as the water level drops. Finally, what’s left will be blasted away to restore the river’s natural flow. The dam removal process will take 2 ½ to 3 years because 15 million cubic yards sediment have collected behind the dams; the release of this sediment must be carefully controlled to protect a downstream fish hatchery, the Lower Elwha reservation, and the Port Angeles drinking water supply. Once the nutrient rich sediment flows downstream, however, it will help restore the estuary, salmon habitats, and beaches. The return of the salmon, which will convey nutrients from the ocean and be a source of food when they die, will also support 100 other wildlife and aquatic species. The area will be replanted to prevent erosion and restore native ecosystems. And the Lower Elwha Klallam tribe will finally have their sacred sites and the salmon, the basis of their culture, restored. The U.S. is home to 2 million dams of various sizes. Bruce Babbitt, former Secretary of the Interior, remarked, “On average, we have constructed one dam every day since the signing of the Declaration of Independence.” The U.S. Army Corps of Engineers has inventoried 75,000 dams larger than 6 feet and tens of thousands of smaller ones. Dams have been built to provide recreation, flood control, fire protection, irrigation, water supplies, or hydroelectric power. Most were built for recreation and flood control and only 2,210 generate hydropower. Today, however, many U.S. dams have outlived their original purpose and over 4,000 have been deemed unsafe. By 2020, 85% of U.S. dams will be over 50 years old, the average life of a dam. Over time some dams become less economically viable. As sediment accumulates behind a dam, the reservoir cannot hold as much water; sediment can block water going to the turbines, or hamper a flood control dam’s ability to capture floodwaters efficiently. The cost of regular maintenance, upgrading machinery to meet regulatory requirements, or liability risk may not make economic sense. In the end, dam removal is often less expensive than trying to maintain or repair an older dam. The decision to remove a dam is usually made by its owner; many dams are privately owned, with the rest owned by the federal, local or state government, or public utilities. Dam removal is paid for by the dam’s owners, federal, state or local governments, or multiple stakeholders. Often a dam is removed in order to undo the multiple detrimental impacts it has on the environment and biodiversity. Dams divert water from rivers for power, reducing the supply of water available to keep downstream ecosystems healthy. 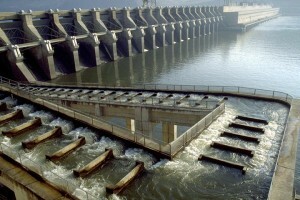 Dams obstruct the migration of fish and wildlife; for example, the U.S. Fish and Wildlife Service estimates that 91% of the migratory fish habitat in northern New England is blocked by dams. Dams also prevent nutrient rich sediments and woody debris needed for habitats from flowing downstream. Dams slow the flow of rivers, which allows sediment to collect on the river bottom and bury spawning habitat. The slowed flow also disorients fish species whose lifecycles evolved to take advantage of the swiftness and natural seasonal variations of a river’s flow. The warmer temperature of reservoir water sitting behind a dam may discourage cool-water fish species from reaching their upstream spawning habitat. Water that is released from the bottom of the reservoir is much colder and contains less oxygen than river water, which can affect the reproductive processes of some fish species; and when water with decreased oxygen is released, it can kill downstream fish. In addition, the creation of reservoir lakes favors species better suited to lake-like conditions, which often harm native fish species. The sediment and silt trapped by dams can accumulate heavy metals and pollutants. And turbines at hydropower dams may injure fish. At dams with fish ladders, fish are often injured or killed swimming up ladders, or become too exhausted or stressed by the warmer water temperatures to spawn successfully even if they reach their destination. Dam removal restores a river’s natural flow and helps increase biodiversity because vegetation and habitats are restored. Wetlands are revitalized, creating alcoves that serve as nurseries for aquatic species, and enhancing plant growth along riverbanks that provide habitat and food for additional wildlife species. Dam removal replaces warmer water species with the native species that are adapted to colder water such as salmon, trout, shad, river herring, etc., and enables fish to migrate freely upstream and downstream, improving their chances for successful reproduction. Dam removal may, however, stir up sediments as they are carried down a free flowing river and this resuspension can damage spawning grounds and habitat, and affect water quality, especially if the sediments contain toxins and pollutants. When the Fort Edward Dam on New York’s Hudson River was removed in 1973, sediments behind the dam had not been tested. As a result, tons of sediment laden with toxic PCBs that had been dumped by General Electric (GE) were washed downstream, affecting human and wildlife health. GE is now in the process of dredging the polluted sediments. But in most cases, resuspension problems are temporary. For example, silt and sediment from the Grangeville and Lewiston Dams on Idaho’s Clearwater River washed downstream in a week after the dam removals in 1963 and 1973 respectively; sediment from the Milwaukee River in Wisconsin settled six months after the Woolen Mills Dam was removed in 2007. And there are strategies to minimize resuspension problems: timing the release of sediments to avoid spring runoff, slowly drawing down the reservoir first, trapping sediment in screens, and dredging the sediments in the reservoir. The Open Rivers Initiative, begun in 2005 by the National Oceanic and Atmospheric Administration (NOAA) in partnership with American Rivers and others, provides communities with funding and technical expertise to remove dams and restore rivers and streams. In the last 50 years, over 600 U.S. dams have been removed. NOAA itself has removed 90 dams and stream blockages, and opened up 1,700 miles of river habitat for migratory fish. In addition to restoring habitat, re-establishiing river ecosystems, opening access to spawning grounds, and improving water quality, dam removals can provide new recreational opportunities and potentially even bring back commercial fishing. American Rivers, which works to remove outdated dams as part of its Restoring Rivers program, calls 2011 the “year of the river” because several notable dams are scheduled for removal. Besides the Elwha River dams, removal of the 95-year-old Condit Dam on the White Salmon River in Washington will begin in October. The Veazie and Great Works Dams on the Penobscot River in Maine will be dismantled this year. Deconstruction is ongoing at the Union and Simkin Dams on the Patapsco River in Maryland. 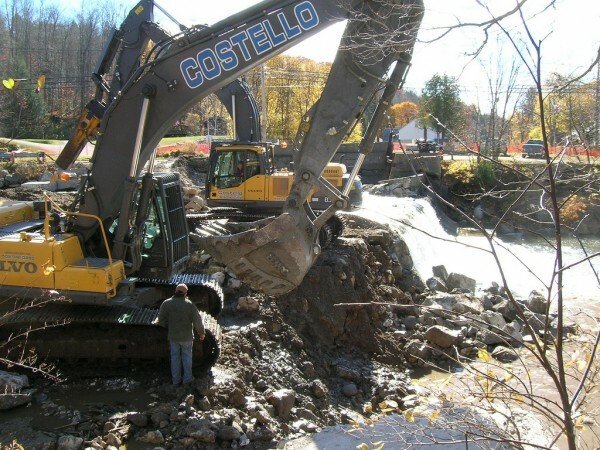 And removal of the Pawtuxet Falls Dam in Rhode Island is the state’s largest dam removal project ever. These removal projects will open up countless miles of habitat for migratory fish. While there are plans to remove many smaller dams around the country this year as well, not all dams are good candidates for dam removal—less than 1% of all U.S. dams are being considered for removal. Despite mounting pressure to reduce our use of fossil fuels, American River contends that damming more rivers for hydropower is not the answer. The focus should instead be on maximizing the efficiency, improving the operation, and reducing the environmental impacts of the hydropower dams that already exist. This can be accomplished by updating equipment, adding hydropower to dams that are in place, and recognizing that dams have a limited life span and preparing a decommissioning plan that includes river restoration. American Rivers argues against the building of new dams because the best river locations already have dams, because dams damage rivers, and because we need healthy rivers and ecosystems as natural defenses against the increased droughts, floods and waterborne diseases that climate change will inevitably bring.